Last year I reported the sad case of an Ancient Murrelet found dead on the icy shores of Okanagan Lake at Penticton, BC. 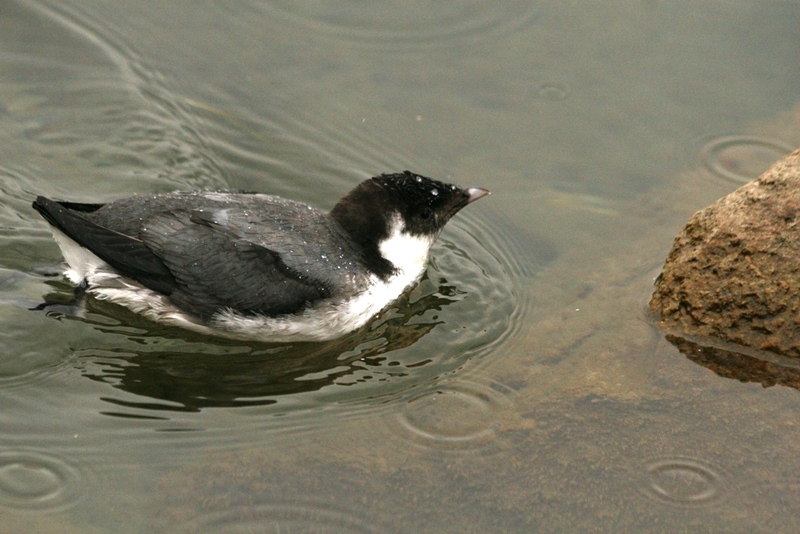 Murrelets are birds of the open ocean, but this species shows a tendency (in some individuals at any rate) of occasionally straying inland to be seen on lakes across the continent. Despite birding in the Okanagan Valley for much of my life I’d never seen one away from the coast. But all that changed today. At about 10:30 a.m. I got a phone call from Laure Neish, who breathlessly reported that she had found an Ancient Murrelet at the Penticton Yacht Club. I quickly said “I’m on my way”, hung up the phone, jumped on my bicycle (this is only 6 km from my house, so would be an easy species to add to my non-motorized transport list!) and was off down the hill in the steady drizzle. After a few anxious moments involving spray in the face, wet brakes and sharp corners, I arrived at the Yacht Club. Laure was there, and helpfully pointed out the bird near the far shore. It gradually came closer, then flew a few hundred metres to the west. I made some more phone calls, including one to Chris Charlesworth in Kelowna. He fortuitously was already out birding (why am I not surprised?) with Mike Force, so they turned south to cover the 1-hour drive to Penticton in prompt fashion. Meanwhile, Laure and I had lost the bird, but it eventually came around a corner of the rock breakwater, its feet churning like a sternwheel steamboat. It foraged within a foot or two of the shoreline, along the beach where its compatriot had met its end last year, and eventually came right along beside us. At one point, it bumped headlong into a rock while looking sideways at me. It kept moving west, and we lost it again for a few minutes, but eventually found it by the walking pier just before Chris and Mike arrived. I’m not sure how many of these lost murrelets eventually find their way back to the saltchuck, but hopefully this one will survive to see Haida Gwaii–the main breeding site of this species–next summer. Such a cool sighting! You were lucky to get that close to this bird.